On the SportsNetwork Privacy thread Major mentioned about finding a new home for the forum before Sports Network totally breaks. I sent him a PM about a site I made a few years ago because I wasn't a fan of Sports Network but never actually did anything with it, however now with the agressive adverts and selling of data I thought it would be a good time to offer View From The 22 as an alternative to here. Take a look around and see what you think, if you have any questions let me know and I'll reply as soon as possible! Edited 1 time(s). Last edit at 07/11/2018 15:21 by Major Bloodnok. Well, it certainly looks a lot better! To make it successful, it just needs all of us to move there. Had a little play, looks fine to me. Has pretty much everything that is here, with more features to boot. Sensitive to where you click thread title to get it to go to the thread, which is a little confusing at first. Couldn't get it to embed video, but that may be blocked by administrator, it still displayed hyperlink to video. Can't spot any highlighting of new or unread posts/topics. Can obviously do it, as there is an option to mark topics as read. Couldn't imagine too much resistance or complication (from a poster perspective) to changing. The frequency of lock-ups and crashes when using rugby network has been increasing for some time. Even now my security is warning me that I should be cautious connecting to this URL. Currently to show there's an unread post it shows up as a star which isn't the most logical so I just need to find where the code is stored for that bit and I'll add an unread label for that bit too! Are you viewing a test platform? I still don't see any difference on the 'live' version. 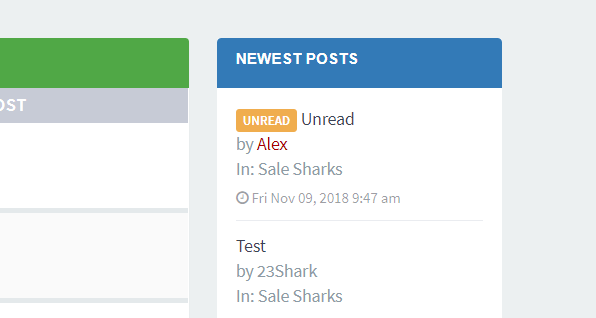 Noting on the index to indicate an unread post in Sale Sharks, no star against your new post, entitled Unread. It looks exactly the same as the other posts. There is no marker in the sidebar either. Spooky, whilst typing that, and checking view from, it has changed I now have all the unread markers as mentioned. Although, a little worryingly, those posts are no longer 'unread'. Couldn't get it to embed video, but that may be blocked by administrator, it still displayed hyperlink to video. Php forums work really well - think I brought up the topic a few months ago and 23 mentioned then he’d done some work on it. It’d be a massive improvement on here. Every few months I suddenly get redirected to a spam site so I don’t trust this place one bit. It certainly seems to have numerous advantages over our current, highly flawed vehicle, but it seems to me that some might hesitate to join in if it was owned lock stock and barrel by one individual.To work well it really would need the majority of clubs to use it. I’ve had a quick look and it seems OK. However, I can’t see any difference between read and unread/new posts. I know it has been mentioned before and it maybe that it is just me being an idiot. My hope was it would be run in a similar way to here, have an appointed mod team to take care of each section/club and for that they'd get a stake in the sites revenue as a thank you for the effort they put in. That would be really useful.Rather than having to scroll to the end of each thread all the time. Edited 1 time(s). Last edit at 15/11/2018 15:09 by 23Shark. There was a previous alternative forum st up by Mrs. T a few years ago when this network seem to be in even worse strife. I've lost the link to it now, but seem to recall it was also a pizza takeaway. Is it now just a matter of we punters starting to post on it? I have to confess that I'd been doing precisely what irritates me when others do it, which is wait for "organisers" to sort it out and tell me when it was ready to roll, Mea Culpa! In my defence, my knowledge of how forums actually work is pretty thin. It's there if it's needed, if not I'm happy to just leave it lying around if there's a change of heart. Wasps have a second forum in operation, but unlike Quins it hasn't fully taken over. I do think 23shark' idea was more on the right lines than either Harlequins or Wasps as it at least attempted to keep all the teams on one login, as it were. Dave is spot in,however irritating SN may be, the ability to use one login and switch between clubs using network navigation is key. I don’t bother with Quins much anymore, although Shedweb is always worth visiting. Hadn’t spotted the Wasps breakaway as mentioned above, but will check. That was the intention Ted, one of the saving graces of SN was the ability to quickly check and post on other forums. Not quite as practical with football forums as the trolling and abuse would be a lot worse but I think it lends itself reasonably well to rugby.